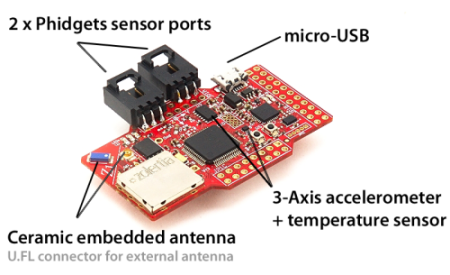 The Z1 platform is a general purpose development platform for wireless sensor networks (WSN) designed for researchers, developers, enthusiasts and hobbyists. It is a platform compatible with the successful Tmote™ family motes with several enhancements that offers roughly a 2x performance in several aspects. Z1 is equipped with a second generation MSP430F2617 low power microcontroller, which features a powerful 16-bit RISC CPU @16MHz clock speed, built-in clock factory calibration, 8KB RAM and a 92KB Flash memory. Also includes the well known CC2420 transceiver, IEEE 802.15.4 compliant, which operates at 2.4GHz with an effective data rate of 250Kbps. Z1 hardware selection guarantees the maximum efficience and robustness with low energy cost. Flexible Powering: Battery Pack (2xAA or 2xAAA), Coin Cell (up to 3.6V), USB Powered, Directly Connected through two wires comming from a power source. USB VCC and GND pins are available on the digital buses expansion port. You can connect to this pins any power of source from 4V to 5.25V and it will be regulated to 5V and 3V. Please find below more relevant information about your Z1 platform, such as the datasheet and pin-out, but also useful resources like specific how-to's and guides.